SYLVAN BEACH -- Three volleys of musket fire by Civil War re-enactors and a flag raising by Civil Air Patrol cadets highlighted the base commissioning of U.S. Coast Guard Auxiliary Flotilla 26 in Sylvan Beach on Sunday, June 3. During the annual commissioning ceremonies that officially opened the Cove Road base for the 2012 boating season, Flotilla Commander Bill Cummings of Utica noted: "For over 50 years Flotilla 26 has answered the call" to serve the boating community of Oneida Lake, offering boating classes, conducting vessel safety checks, patrolling the lake, assisting boaters in distress, and providing search-and-rescue. 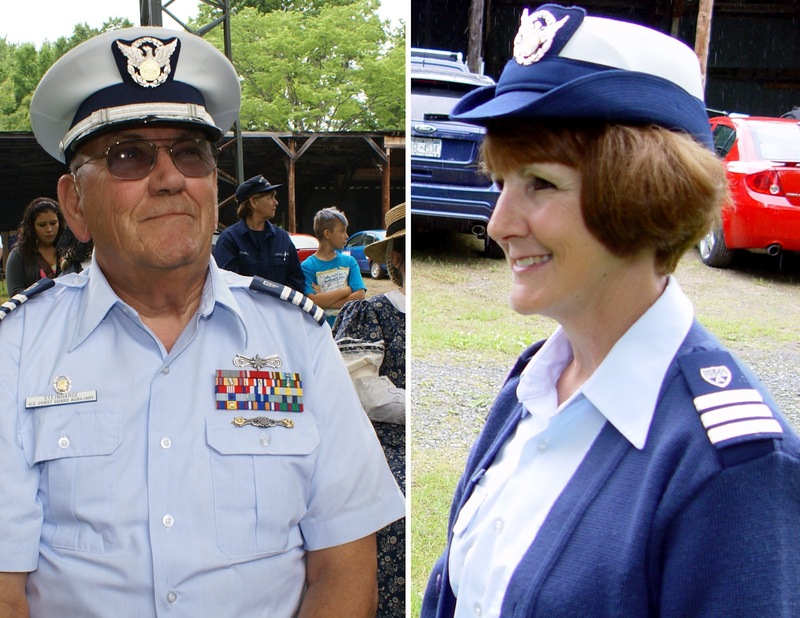 Over 50 Coast Guard Auxiliary personnel and special guests attended the ceremonies and a picnic reception. Several members of the 12th Infantry, a Civil War living history regiment based in Syracuse, escorted the Civil Air Patrol cadets from Utica Cadet Squadron as they presented the colors and hoisted Old Glory along with the Coast Guard flag and several Coast Guard pennants. First Sgt. Neil MacMillan (left) and Corporal Grant Denis fire a volley. Then, First Sgt. Neil MacMillan of Syracuse and Corporal Grant Denis of Ithaca raised their muskets high and fired a volley, with plumes of smoke spewing for several feet. In some 20 seconds they had reloaded the muskets and were set to shoot again. They repeated the process for a third volley. A little later in the ceremonies the Civil War re-enactors were called on again to fire three volleys in tribute to members of the Coast Guard who died in the past year. In his remarks, Cummings noted that the Coast Guard Auxiliary was founded in 1939 and today has some 30,000 members nation-wide. With the Oneida County Sheriff's Marine Patrol operating out of the Coast Guard Auxiliary Base, Sheriff Rob Maciol was a special guest, who offered brief remarks and thanked the flotilla "for all your efforts" on behalf of boating safety. Earlier, Sheriff's Lt. Jim McCarthy told news media that the Coast Guard Auxiliary "is a great asset to the Oneida Lake community and the Sheriff's Department." Division Leaders John Steinbarge and Helen Lou Cummings. Other dignitaries included Central New York Division 2 Commander Helen Lou Cummings of Utica, Division Vice Commander John Steinbarge of Baldwinsville, and Sylvan Beach American Legion Post 1153 Commander Guy Berogan. Flotilla 26 Vice Commander Karen Beehm of Hubbardsville offered the invocation and benediction. Two members of Flotilla 2-14 in Bridgeport -- Flotilla Commander Rick Kunz and Bob Shanahan Sr. -- served as AuxChefs (auxiliary chefs) for the picnic reception. The Utica Civil Air Patrol cadet color guard included Cadet 2nd Lt. Tyler Kulesa, Cadet 2nd Lt. Aaron Dostie and Cadet Sr. Airman Aidan Uvanni. They were accompanied by their mentors, Capt. Paul Kulesa and Capt. Patrick Dostie. Re-enactors MacMillan and Denis were accompanied by 12-year-old Nathan Bowers of East Syracuse, who served as a private, and two women dressed in Civil War era dresses, Peggy Reilly of Syracuse and Lori Bowers of East Syracuse. They represented families who often had accompanied troops when they were garrisoned.